Tweet this on your Twitter account: Hey @Crackberry - I want to win the @TeleNav bundle! That's all there is to it! It's a bit of work, but it's worth it! 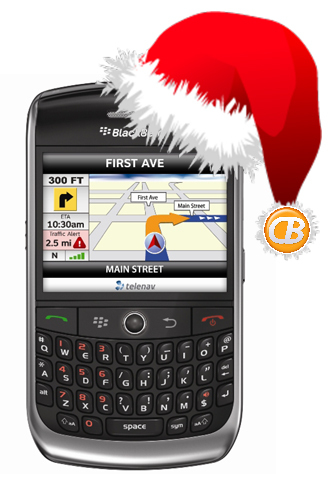 If you win you will receive a one-year subsctiption to TeleNav GPS Navigator, a $100 ShopCrackBerry.com gift certificate, a car charger and device car mount. In addition, we'll also be giving a $100 donation to Toys For Tots in your name. We'll also draw for two second place winners that will also receive a one-year subscription to TeleNav GPS Navigator. So what are you waiting for?! You only need to enter once, and winners will be announced on December 24th - so get going!